Vale End Cemetery: The Blue Lady, Lights and Grovers? OK, so I have heard all the scary rumors of demonic little creatures jumping on cars, chasing people, and causing wierd things to happen. I read about the strange lights (Don’t all supposedly haunted cemeteries have THOSE?) and the spirit of a woman who may have been spurned (Or just upset that her cheapskate hubby burried his 2nd wife with her when she died as well). All this sounds like a typical day in the life of Vale End Cemetery in Wilton NH if you believe everything you see on the internet. Odd how only the “investigators” are the only ones reporting these occurences while the locals seem barely aware. They have heard the stories of poor Mary Ritter Spaulding whose grave is home to some strange blue lights, but other stories I’ve seen, they know nothing about. The only blue lady we saw today was a wildcrafting woman who often roams the cemetery but couldn’t find any mushrooms on this occasion. Local authorities monitor the site well (due to tresspassing intruders at night, go figure) and none have reported seeing anything odd. No funny lights (of course it was day) and no odd cold spots, no gnome like creatures out of the corner on they eye, no car trouble caused by gremlins. Who started calling these little demons “grovers” in the first place? Too much LSD in the Kool-Aide while watching Sesame Street I’d bet. 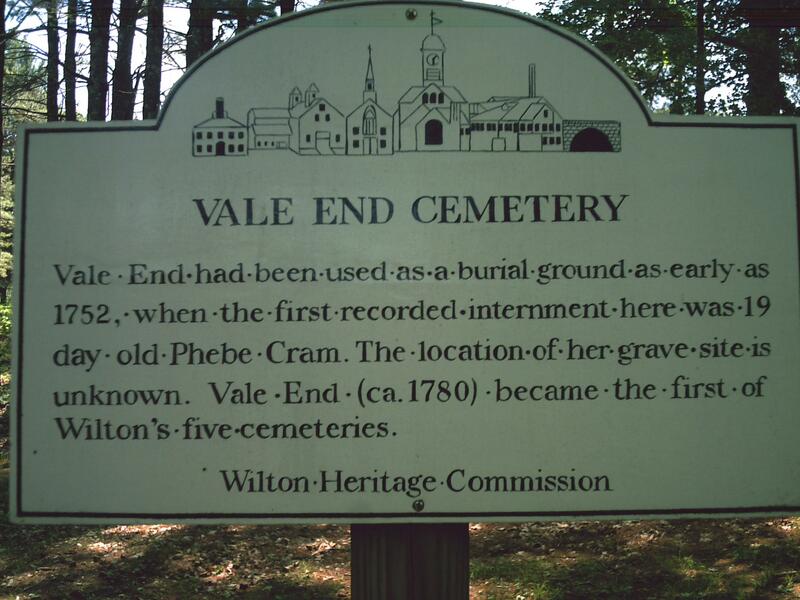 Vale End Cemetery is NOT the hot spot of phenomena some would like you to believe. What it IS is a beautiful rural woodland cemetery set on a hill near a bright blue pond that you can glimpse through the trees at one end. The back road leading there is narrow and if another car approaches one has to move over a bit to make room, taking care as the car brushes against the bushes on the side of the road. The earliest stone I saw was 1769 and the only sad thing I noticed was a center area where there seemed to be a lot of children’s graves. Go visit during the day if you can. It’s peaceful and the location is beautiful. What an awesome day we had! on June 5, 2011 at 6:05 pm | Reply Vale End Cemetery: The Blue Lady, Lights and Grovers? « In The … | Weird Cars! About 7 years ago I went to this cemetery around 11pm. we heard people walking all around the car, all the batteries from our camera’s died, and it was the coolest thing I ever experienced. Tonight on our way back from Spooky world we decided to go find it again. This time at 1am, but with no luck we drove for 45 minutes up and down sand hill rd with no luck. but I will find it again…………and dance with the lady in blue. mwahahah!! I took a picture of the blue ladies grave and there was a woman peering behind it. This was only my second time going there we went for fun. I’m not sure how to attach photos but it is very clear its a woman.